Value Chains for Nutrition in South Asia: Who Delivers, How, and to Whom? There is currently much talk of the private sector role in nutrition, and whether the state can ‘shape’ the market to deliver better nutritional outcomes. This issue of the IDS Bulletin presents research findings in this area, developed by the consortium of research partners under the Leveraging Agriculture for Nutrition in South Asia (LANSA) programme. 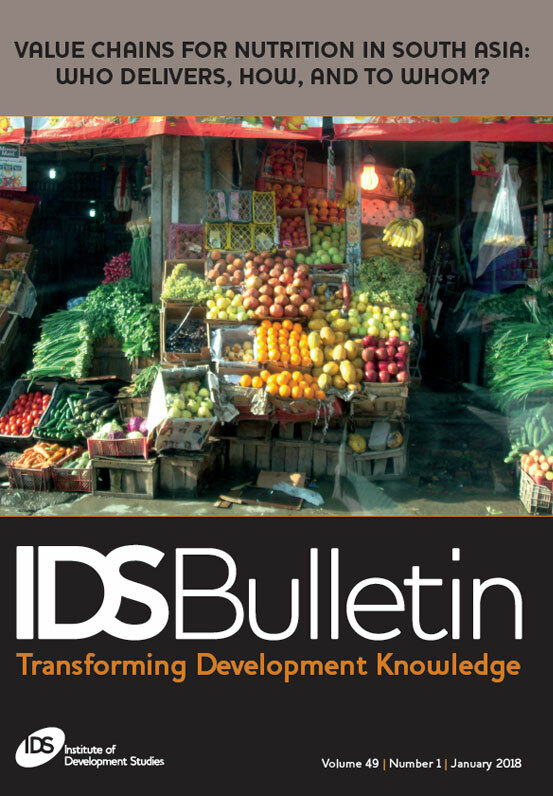 The IDS Bulletin aims to analyse existing (or potential) agri-food value chain pathways for delivering nutritious foods from agriculture to vulnerable populations in South Asia. It discusses the role of both public and private actors in making these value chains more effective in achieving sustained increased consumption of nutrient-rich foods. In comparing the different pathways, this set of articles warns against the assumption that increasing the supply of certain products will directly lead to increased consumption. It highlights how, in South Asia, interventions or policies that try to enhance these pathways often struggle because of a mix of supply, distribution, marketing, and consumption challenges. This IDS Bulletin argues that the key to sustainable food systems might be a ‘food sovereignty’ approach. This calls for awareness at all levels of decision-making – public, private and civil society – in the promotion of nutrition-sensitive value chains, emphasising the need for a stronger government role in shaping agri-food value chain pathways. 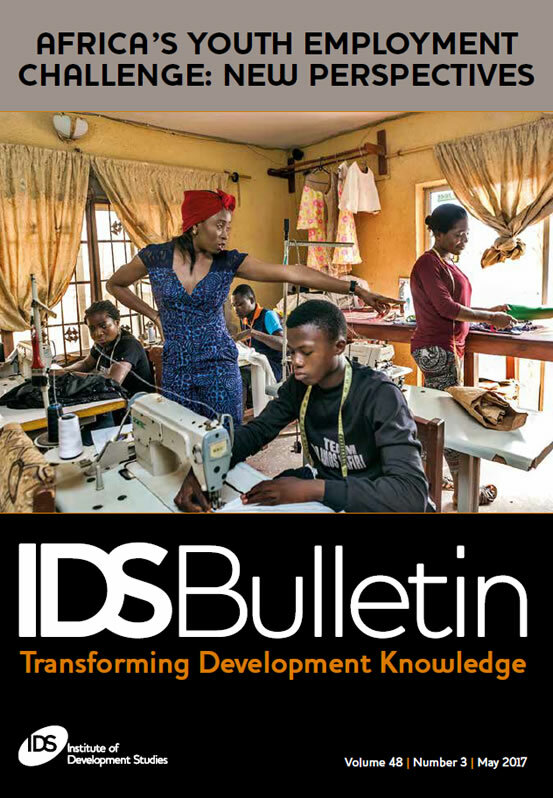 By looking at the limits of what business can and cannot achieve in a given market environment, the IDS Bulletin provides insights to policymakers about how to create an appropriate institutional environment that shapes how these value chains operate for the benefit of nutritionally vulnerable target groups. Inadequate power supply in sub-Saharan Africa (SSA) means that only 37 per cent of sub-Saharan Africans have access to electricity. Those with access are prone to experience problems with regular power outages. In many sub- SSA countries, electricity access rates are decreasing because electrification efforts are slower than population growth. The authors of this IDS Bulletin provide insights from power systems engineering, macroeconomics, microeconomics, and political economy on how to overcome constraints to green electricity in Africa. One of the biggest contributions of this issue is that is allows a dialogue between academics and practitioners that would not normally be published in the same journal. What also emerges as an underlying thread is the essential role of donors to achieve sustainable energy for all in Africa. 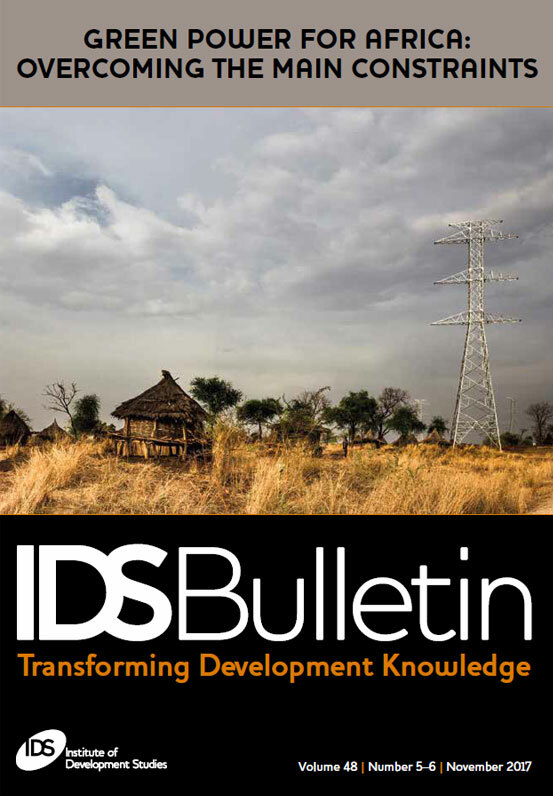 The contributions to the IDS Bulletin underline the enormity of the clean electrification challenge in Africa, and demonstrate the benefits of a multidisciplinary approach where technical, economic, and political perspectives are involved in the design of interventions. Humanitarian crises appear dramatic, overwhelming and sudden, with aid required immediately to save lives. Whereas climate change is about changing hazard patterns and crises are in reality rarely unexpected, with academic researchers and humanitarian and development organisations warning about possible risks for months before they take place. While humanitarian organisations deal directly with vulnerable populations, interventions are part of global politics and development pathways that are simultaneously generating climate change, inequities and vulnerability. So what is the level of convergence between humanitarian interventions and efforts to support adaptation to climate change, and what lessons can be drawn from current experience on the prospects for reducing the risk of climate change causing increased burdens on humanitarian interventions in the future? 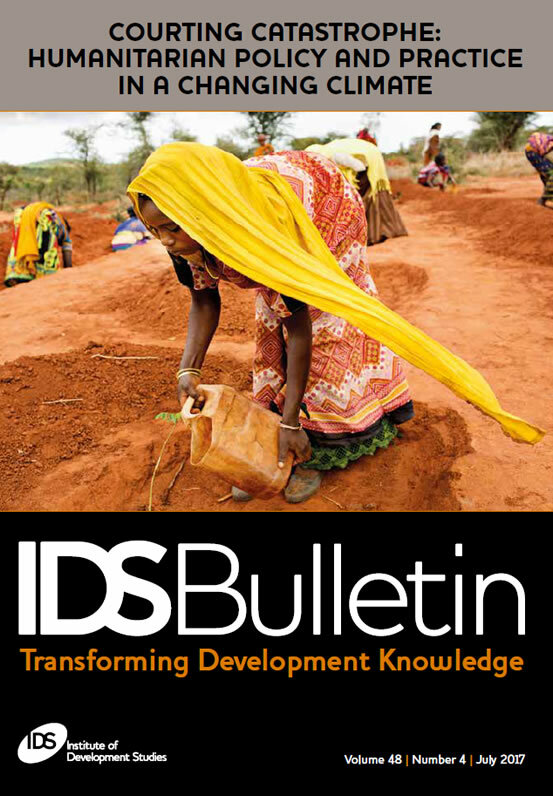 This IDS Bulletin is a call for increasing engagement between humanitarian aid and adaptation interventions to support deliberate transformation of development pathways. Based on studies from the ‘Courting Catastrophe’ project, contributors argue that humanitarian interventions offer opportunities for a common agenda to drive transformational adaptation. Changes in political and financial frameworks are needed to facilitate longer-term actions where demands move from delivering expert advice and solutions to vulnerable populations to taking up multiple vulnerability knowledges and making space for contestation of current development thinking. Yet while the humanitarian system could drive transformative adaptation, it should not bear responsibility alone. In this issue, alternative pathways and practical ways to support local alternatives and critical debates around these are illustrated, to demonstrate where humanitarian actions can most usefully contribute to transformation. Who are the youth and what is the problem? Are entrepreneurship and self-employment the solution? And what about youth aspirations? Such questions are addressed in this issue of the IDS Bulletin, drawing from the literature on how development research affects policy and noting that it says little about how young researchers move into policy engagement. Articles consider the evidence on youth employment policy and interventions, the politics of youth policy, the changing nature of young people’s work, and the promotion of entrepreneurship. They are authored by the ten members of the first cohort of the Matasa Fellows Network (a joint initiative by the MasterCard Foundation and IDS), which has a particular focus on the youth employment challenge in Africa. Youth and employment concepts are not new to development discourse in sub-Saharan Africa but over the last decade interest has increased dramatically, becoming an increasingly important focus for policy, intervention and research throughout the continent (and globally). Fundamental to the Matasa initiative is the proposition that no matter how innovative or rigorous the research, policy influence will seldom be achieved by adding policy recommendations to a research paper. Rather, influence requires reflection, strategy, planning and tactics, and above all a nuanced understanding of the context and the politics that shape any given policy process. This IDS Bulletin reflects these challenges in Africa and demonstrates how political context shapes youth-related policy. It illustrates the need to critically reflect on the multiple and divergent meanings of work and employment and to re-think interventions that promote entrepreneurship and self-employment. The scope for quality research and effective policy engagement is tremendous. What are the smaller stories hidden within the larger trends on governance in Africa, and to what extent has decentralisation affected change in these areas? What are the factors that keep local government reforms from achieving more complete outcomes? 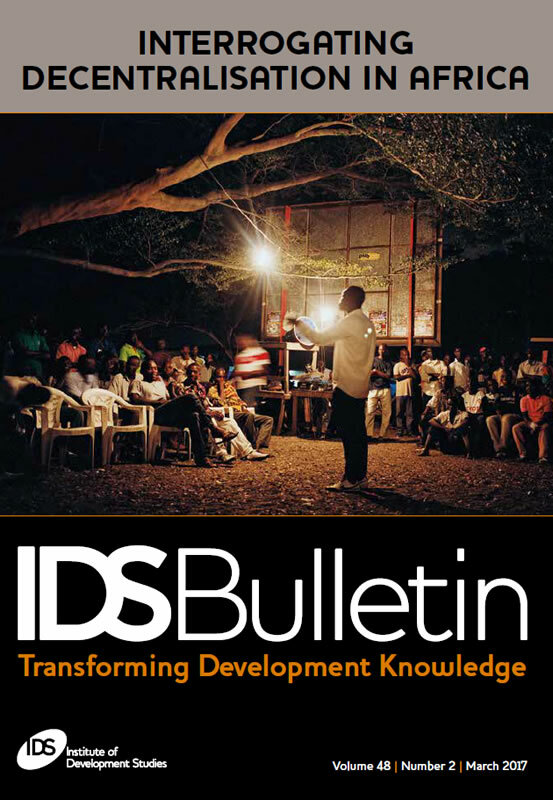 These are the main questions asked by this IDS Bulletin, with articles focusing on explanations for the impact of decentralisation at the local level through detailed case studies of five countries – Ghana, Nigeria, Kenya, Uganda and Ethiopia. This issue deals with all three of the main aims for decentralisation reforms in Africa: improved service delivery, democracy and participation, and a reduction in central government expenditure. It analyses micro, comparative stories by accumulating evidence on how decentralisation works differently within each featured country, and the factors that are responsible for differential outcomes. Contributors are mostly African scholars who live under the region’s decentralised systems and study them with a proximate lens often denied to visiting scholars. Their research questions, on their countries’ respective policy agendas, are joined by the common belief that more innovative methods should be applied to these questions in order to get at better explanations. While decentralisation is an important issue, systematic analyses of its outcomes are limited. This IDS Bulletin represents first efforts to use more innovative and incisive methods to understand decentralisation and its impact – with more resources, such enquiries can be strengthened to provide deeper understanding. The set of studies presented here already represent exciting and important new contributions to a field that requires more attention.